Blaine Rodgers has an extensive background in the cattle industry, and has worked in the nutrition and feed industry for more than 10 years. 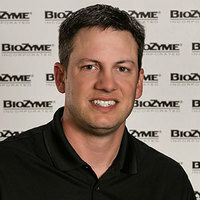 Blaine joined BioZyme in 2014. Rodgers’ passion for livestock began at an early age and continued through college where he was a member of the Modesto Junior College and Cal Poly San Luis Obispo livestock judging teams. Blaine obtained his B.S. in animal science from Cal Poly. Prior to joining BioZyme Rodgers served as a Territory Sales Manager and Show Feed Specialist for OH Kruse Grain and Milling. Rodgers resides in Savannah, MO, with his wife, Melissa, and their two daughters, Payton and Reagan. Together they operate Rodgers Livestock, a cattle operation that focuses on raising and selling steers, heifers and breeding cattle.